A new wave of research highlights difficult decisions facing policymakers. PES-induced watershed regeneration activities in Chaina, benefiting thousands of downstream agricultural and drinking water users. LIMA, Peru—To stop the loss of the world’s forests, countries around the globe have set an ambitious goal of replanting 150 million hectares of deforested and degraded land by 2020. Latin American and Caribbean countries have pledged to begin restoring at least 20 million hectares by then. But there is more to meeting the target than just planting trees, according to a series of studies published in a special issue of the journal Forests. 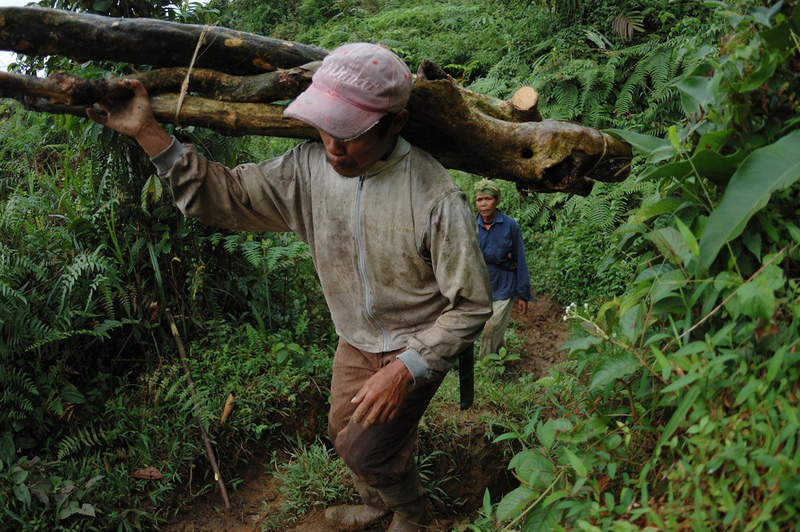 How countries govern their farmland and forests plays a large role in the success or failure of restoration programs, the authors say. Ecological restoration—“the process of assisting the recovery of an ecosystem that has been degraded, damaged, or destroyed,” according to the Society for Ecosystem Restoration—requires long-term commitment by all levels of government as well as landholders, corporations, researchers and others. “We wanted to know the extent to which the theory and practice of forest restoration was being contemplated by this wide range of stakeholders, while confronting both the opportunities and challenges in applying legal instruments and inter-sectorial policies from the local to the global level,” said Manuel Guariguata, head of research on production forests at the Center for International Forestry Research (CIFOR) and a co-editor of the special issue. By bringing together the results of studies of forest restoration from around the world, the special issue, “Governing Forest Restoration: Social, Environmental and Institutional Dimensions,” provides insight into successes, bottlenecks, and the principles of governance necessary to make reforestation work for nature and for people. In practice, countries must decide which activities they will stimulate—restoration plantations, natural regeneration, exotic tree plantations, forest management, or a combination—and identify the main challenges in implementing them, according to Pedro Brancalion, professor of native species silviculture at the University of Sao Paulo in Brazil and a co-editor of the special issue. Economic incentives must be provided to farmers or other landholders. Those might take the form of payment for environmental services, developing markets for timber and non-timber forest products from restoration sites, and technical assistance for reforestation. Some progress is already being made in South America, says James Aronson, head of the restoration ecology group at the Center for Functional and Evolutionary Ecology in Montpellier, France, and co-founder of the Restoring Natural Capital Alliance, a network of organizations and individuals involved in ecological restoration. How do these laudable commitments trickle down to the local level both efficiently and equitably? For example, Ecuador and Colombia have approved ambitious national restoration plans. In November last year, a change to Argentina’s Civil Code made the environment a “legal good,” which will enable citizens to demand that the government take steps to stop degradation or to restore ecosystems, he says. On Brazil’s Atlantic coast, where only 12 percent of the original forest cover remains, a coalition of more than 260 stakeholders—including researchers, non-profit organizations, government agencies and private enterprises—has committed to restoring 15 million hectares of deforested and degraded lands by 2050. With state governments also playing an important role, the Atlantic Forest Restoration Pact is an example of both bottom-up and top-down governance, Aronson says. And the Brazilian state of Pará has taken the lead in a different way, becoming the first state in the Brazilian Amazon to adopt an explicit definition of second-growth forest, based on biophysical characteristics. But managing the natural regeneration of “second-growth” forest poses special challenges, say the authors of one study from the special issue. These challenges include unclear terms and definitions, inconsistent regulations at different levels of government, and a common perception that secondary forests have little value when they should be seen as beneficial because of their role in restoring degradation by providing ecosystem services and maintaining biological diversity. Promoting restoration through natural forest regrowth is a cost-effective practice, but it requires a combination of technical, socio-economic, political and regulatory considerations, say the authors, who urge dialogue between agricultural and environmental decision makers. There is yet no unambiguous framework for how best to guide the process of decision making and implementation of forest restoration from the national to the local level, write the authors of an Indonesian study in the special issue. With the existing international commitments to forest restoration, further research can help address conceptual as well as practical challenges, Guariguata says. For more information about the special issue, please contact Manuel Guariguata at m.guariguata@cgiar.org.